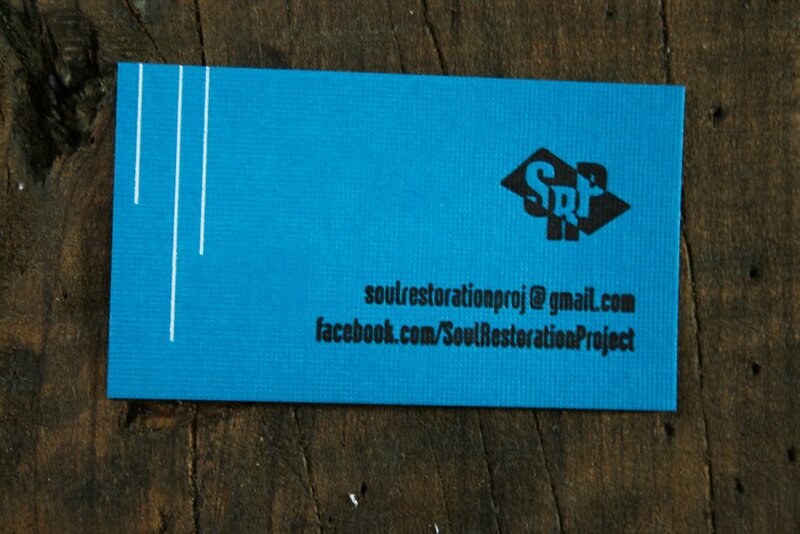 Soul Restoration Project’s business cards were printed on a custom duplexed turquoise-ish blue paper stock with a laid (ie. paper that has a finely ribbed appearance) finish. (There’s all kinds of innuendo there that I want to take advantage of, but won’t). 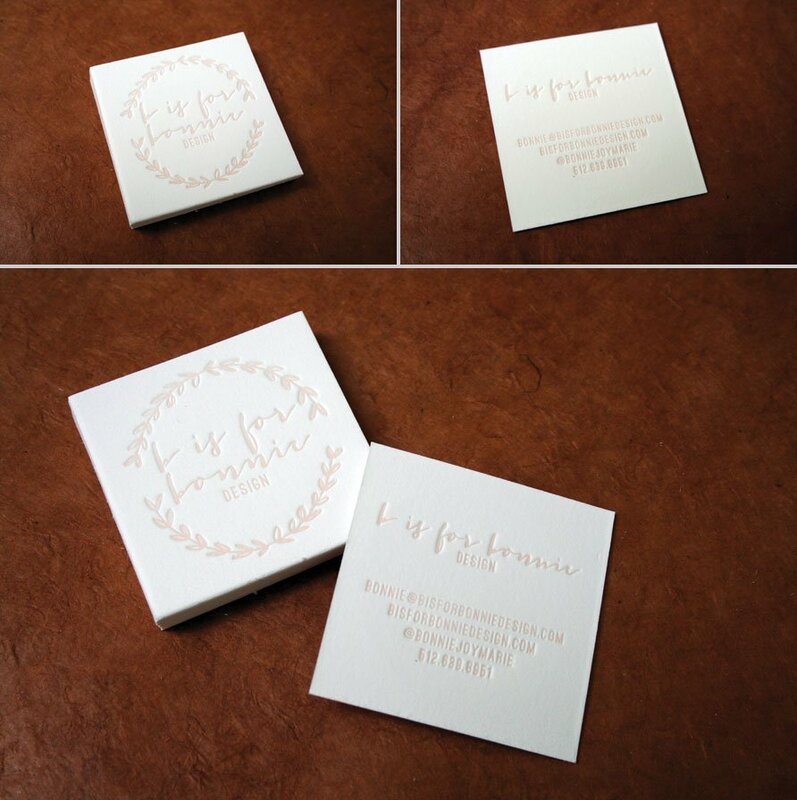 Their logo was printed on the front side in black ink with accents of white and shiny gold foil! The backsides of the cards feature the logo and white accents from the front and has their Facebook page and email address info. 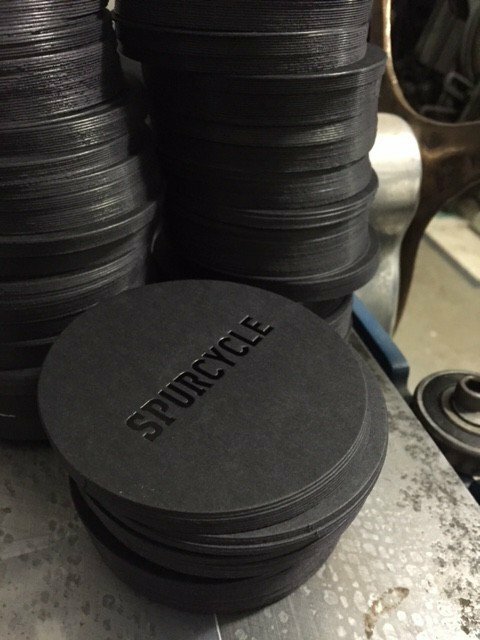 I’ve had a busy day, so this post is going to be brief, but I wanted to tell you all about a really cool promotional product that we did back in December for an awesome little company in Sausalito, California called Spurcycle! 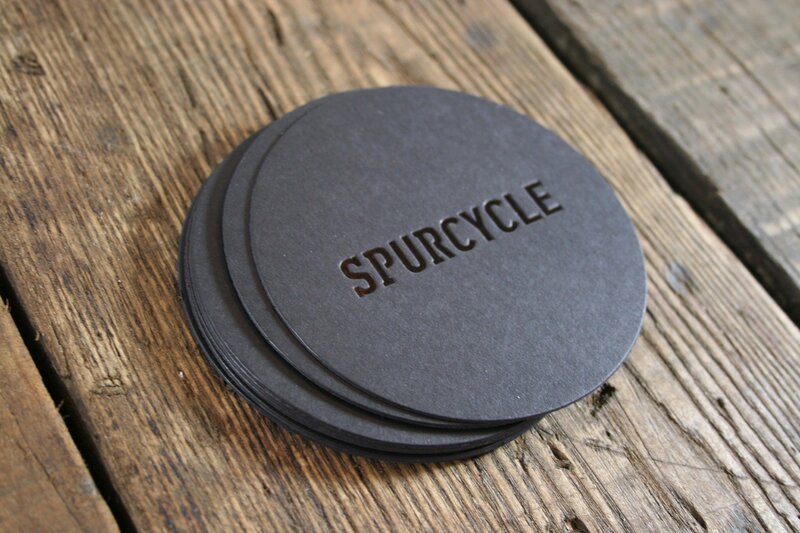 Spurcycle was founded in 2012 and specializes in designing and producing beautiful bicycle products. Owners Nick & Clint Slone are engineers who embrace clean, quality designs that serve well understood cycling needs. 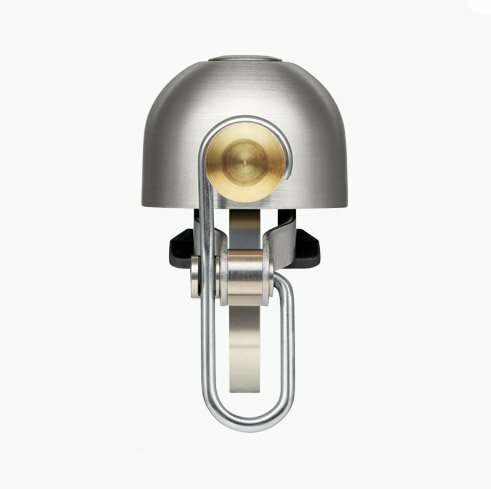 Their main product is the gorgeous brass and stainless steel bike bell that you see below. They are made in the USA and guaranteed for life! 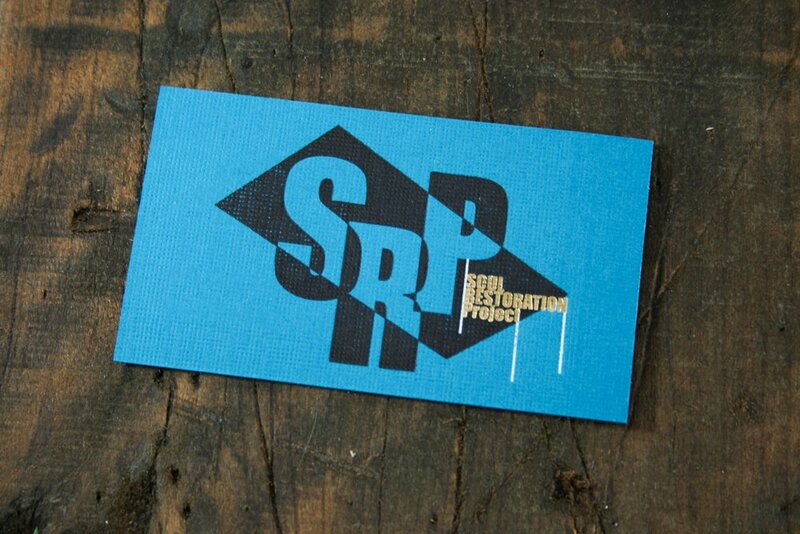 At any rate, back in December Clint contacted us about letterpress printing a promotional product that they could write notes on and slip in with their orders. We worked with them to produce the beautiful black hot foil stamped coasters that you see at the top of this post and below. 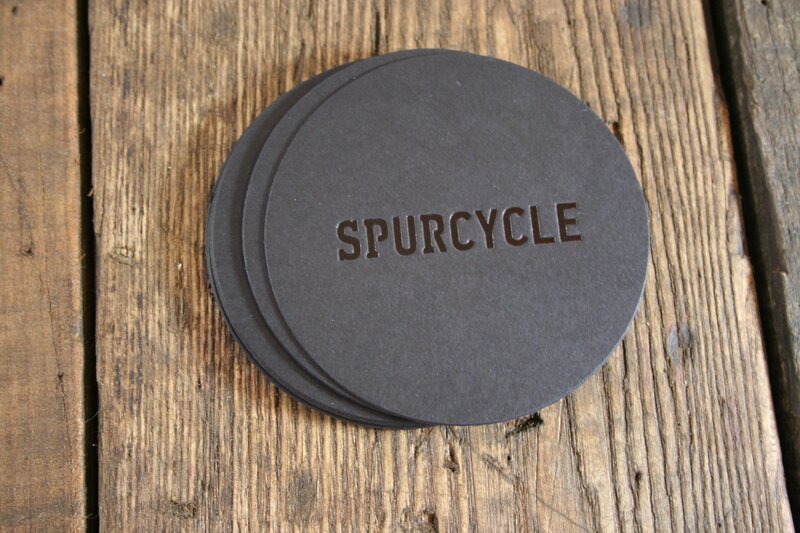 These coasters were letterpress printed with a shiny black foil and die-cut from Sirio Ultra Black cover stock. They are 3.5″ in diameter and feature the company logo on one side and space to write (in white, metallic or gel pen) on the back! They’re so clean and crisp and I just love how the black-on-black combination turned out! Here’s a candid photo we took that you may have seen on our Instagram back in December of all of the coasters in a giant stack after they came off of the press. Thanks so much for working with me Clint, Nick, & Adisti! I really enjoyed working with you on this project and hope we can collaborate again in the future! 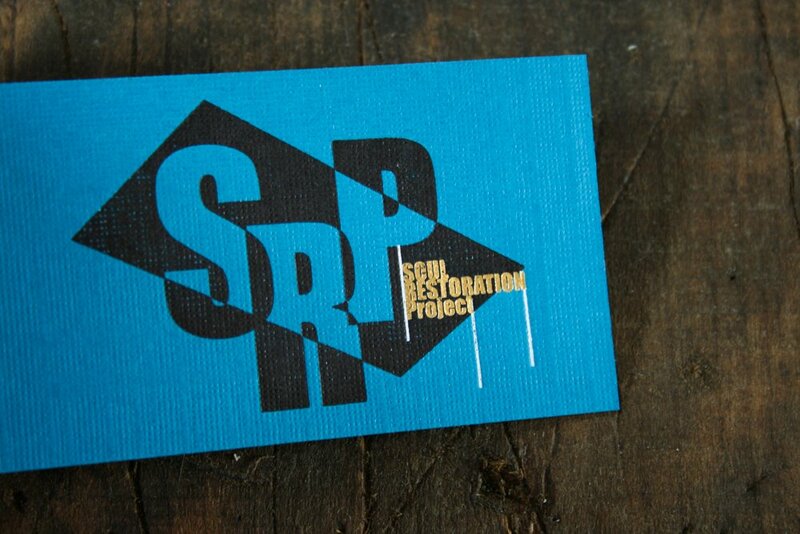 I really love it when friends and family design business cards for the people they love! It’s such a fun, personal, and highly useful gift. The cards you see above were a Christmas present this year from a boyfriend (Geordie) to his girlfriend, personal chef, Katy Malone. Geordie created the hand drawn vegetables and fruits for the decoration on these cards, and then worked with me to select fonts, ink colors, and a paper that she would like. The above cards were printed in a deep chocolate brown ink on handmade paper from Porridge Papers‘ Blue Collar line. The paper we selected is called “Brewhaus”, which is a handmade, super-soft, recycled paper with spent grain inclusions of wheat and barley from a brewery in Lincoln, Nebraska. 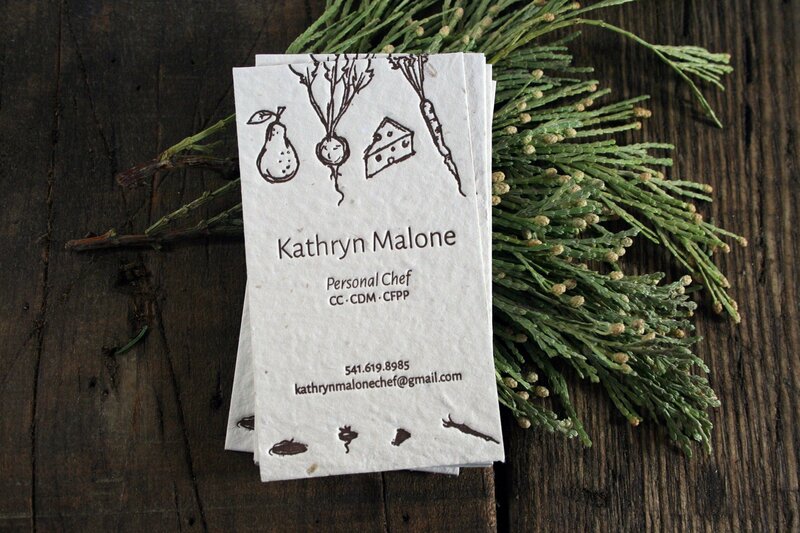 I just love how eco-friendly and totally thematically appropriate they are for a chef working in the Pacific Northwest! It’s really cool to have really cool friends. I think that goes without saying, but it’s nice to point it out every now and again. I met Michael Werner and his wife, Katie, four years ago when both were teaching Journalism at the University of Oregon, and they were looking for someone to create their wedding invitations. The wedding invitations we did for them are still one of my favorite suites we’ve done, ever, and after doing the job, the three of us became great friends. Michael and Katie moved north to Seattle not too long after that, but we’ve kept in touch, and I was super-excited when Michael contacted me about creating a set of business cards for him. 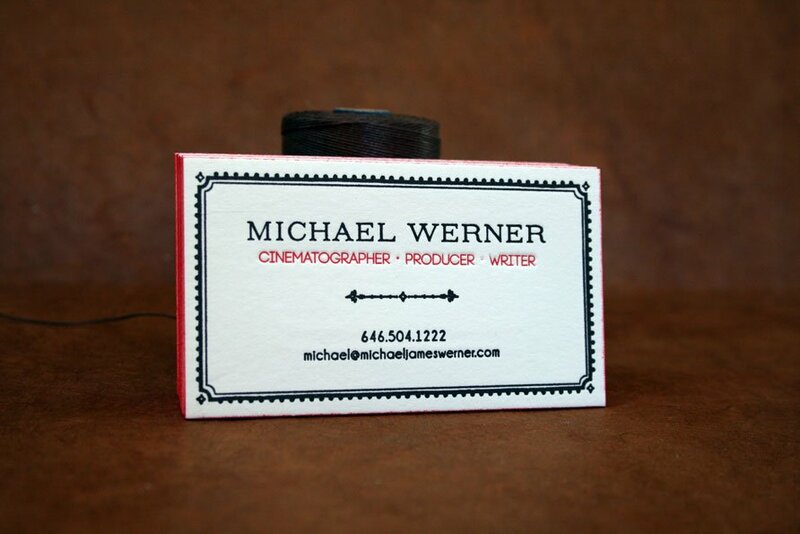 Michael’s snazzy cards are black & red and feature some awesome blind embossing of a photograph he took outside of Seattle on one side. They were printed on super-thick Crane Lettra Bright White paper and feature really bright red edge painting. They really stand out from the crowd! Michael is an Emmy award-winning filmmaker, cinematographer and editor who’s work has been featured by PBS, The New York Times Company, The Associated Press, and The U.S. Olympic Committee, among others. His work has also been shown at the Cannes International Film Festival. If you’d like to learn more about Michael and his work, check out his website! Thanks so much for working with me on these, Michael! I’m so glad we’ve kept in touch! 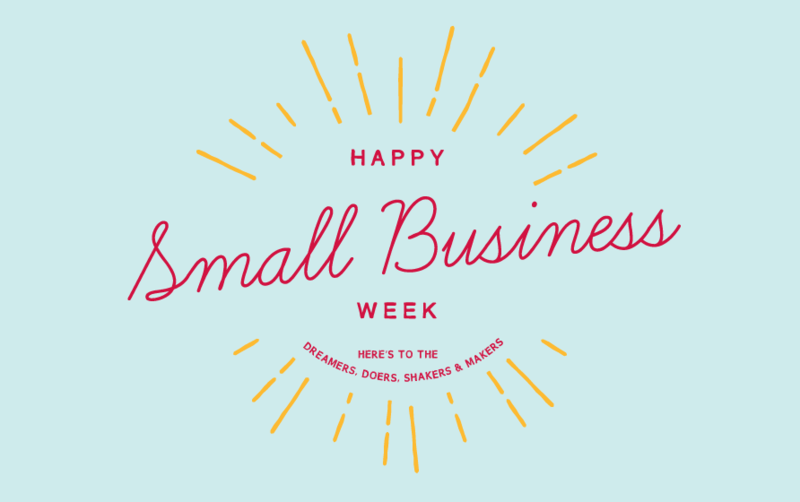 Google informs me that it’s Small Business Week this week! In celebration of our small business, and in celebration of all of you who have a passion, who have decided to give the middle finger to corporate America, and who have taken a chance and not looked back, we’d like to offer a lovely little discount. 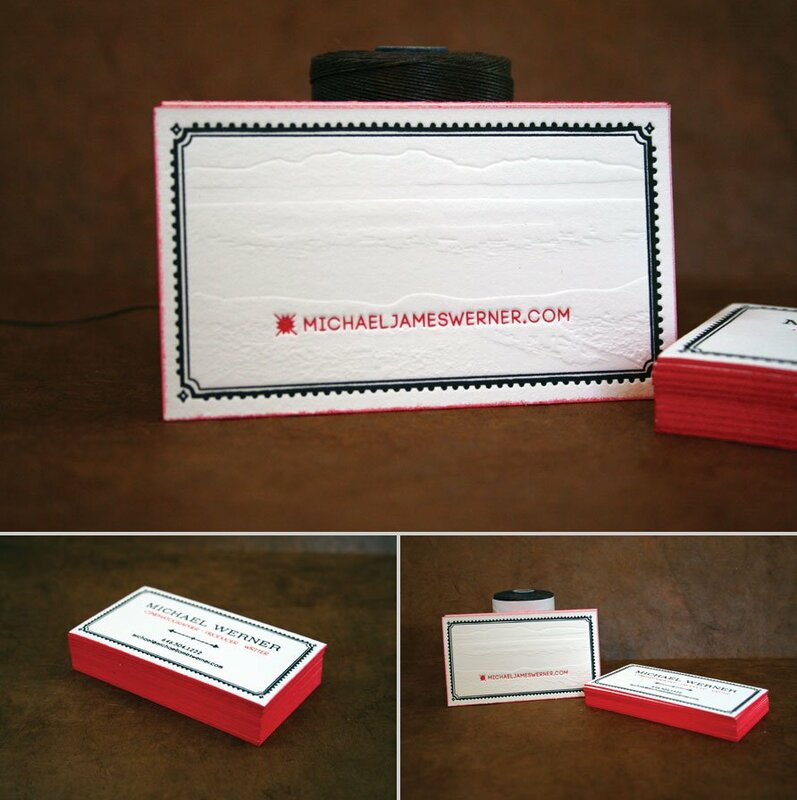 In celebration of small business week, all business card and business stationery new and re-orders placed this week (with signed contract and deposit) will receive 15% off*. Now that’s something to smile about. Contact us for more info or to place an order. * Discount does not include shipping and platemaking. Boy, howdy! Was I excited to get this little business card job! 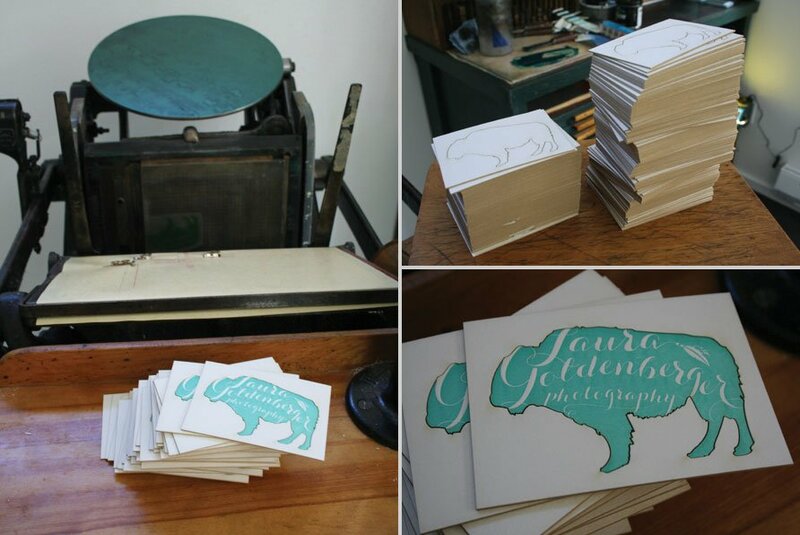 We’ve been working with Lynda Asprinio and her wedding stationery clients at Write Away For You Calligraphy for years, so I was beyond thrilled when Lynda herself hired us to letterpress print her new business cards! 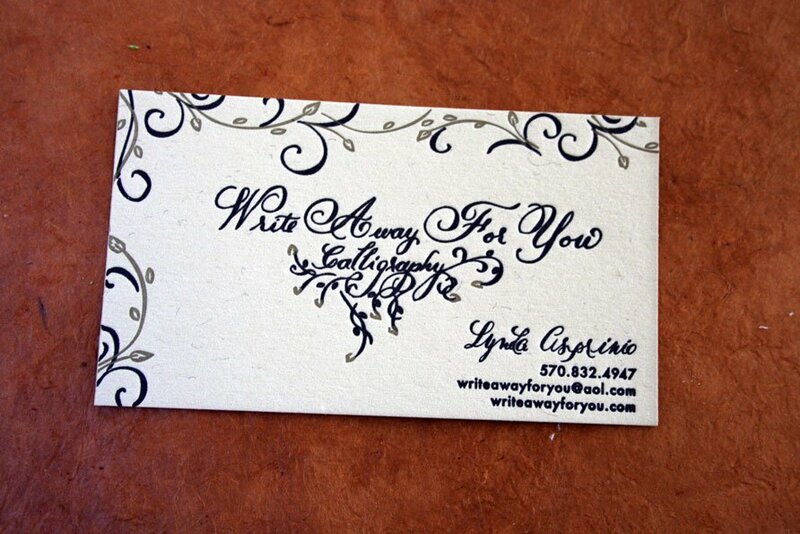 Lynda’s cards feature her calligraphy and some beautiful calligraphic vine border designs. They were printed in two ink colors: gold and black, on a very unique paper. The paper is Magnani Annigoni, which comes from a small mill in Italy and is a distinctive natural color with flecks of wool fiber it it! I love it! 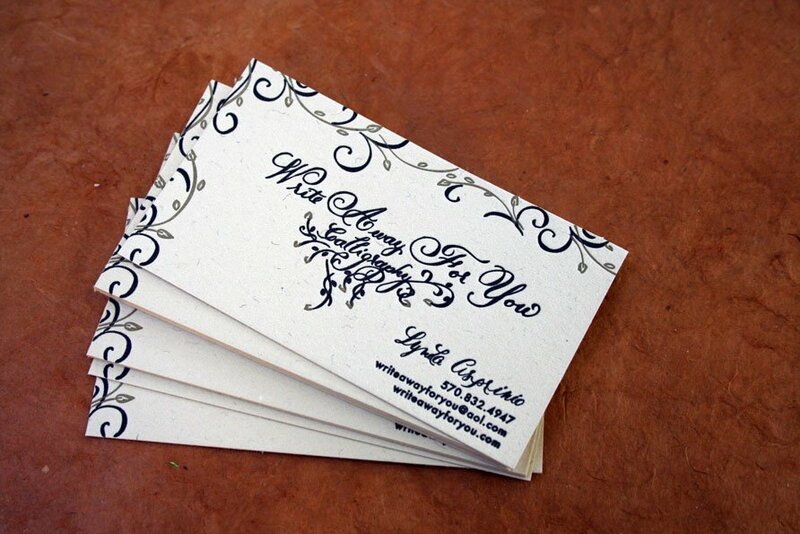 Lynda is based in Pennsylvania and specializes in hand calligraphy for weddings and other special events. You can find more information about her styles and pricing and see more examples of her work on her website! If you’re planning a wedding or other special event, I would highly recommend Lynda! Go check her out! Twin Ravens Press recently had the pleasure of working with the wonderful owner of Petite Vintage Interiors, a Children’s Interior Design Boutique located in Queensland, Australia, on a new set of custom letterpress business cards, that are super-fun and unique! Bel wanted something really special for her business’ new cards and definitely wanted them to be “not something you’d see everyday”. The above card is what we came up with! 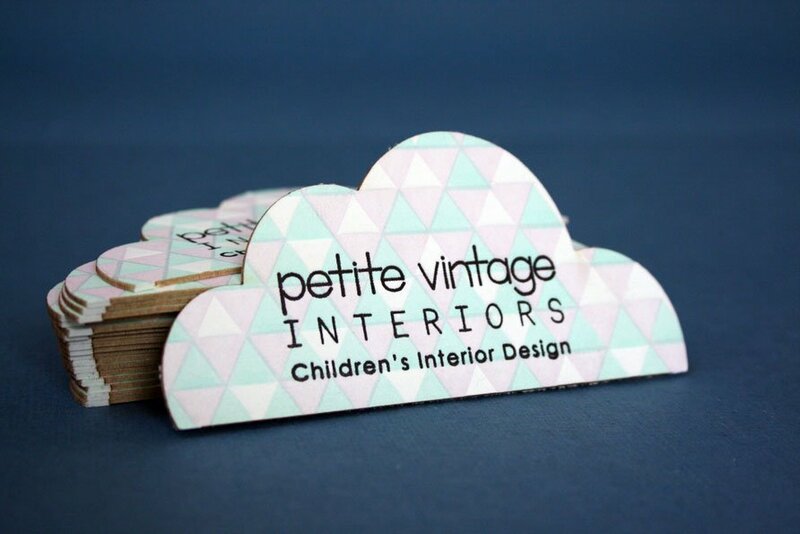 It’s a custom laser-cut cloud shaped card that was cut from 100% cotton duplex paper and then printed in three ink colors: pastel pink, minty green and black. 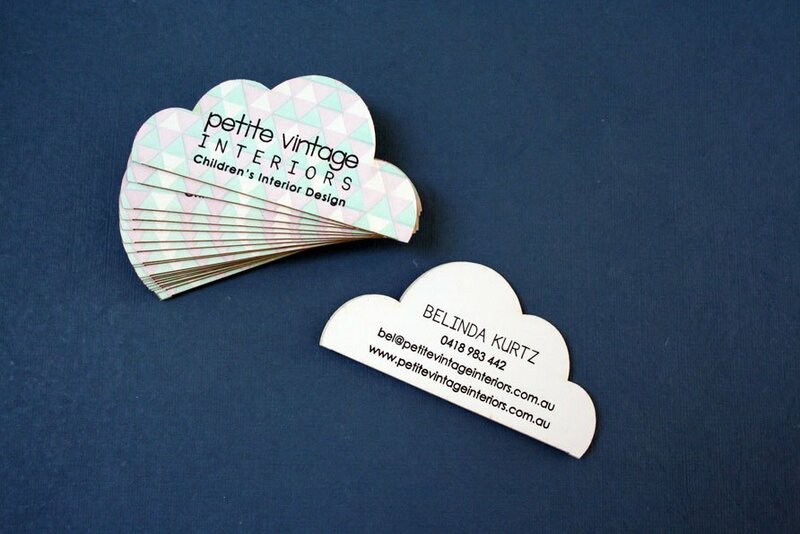 The front of each card has the company logo and is reminiscent of the cloud logo on their website. The back side has Bel’s name and contact information. 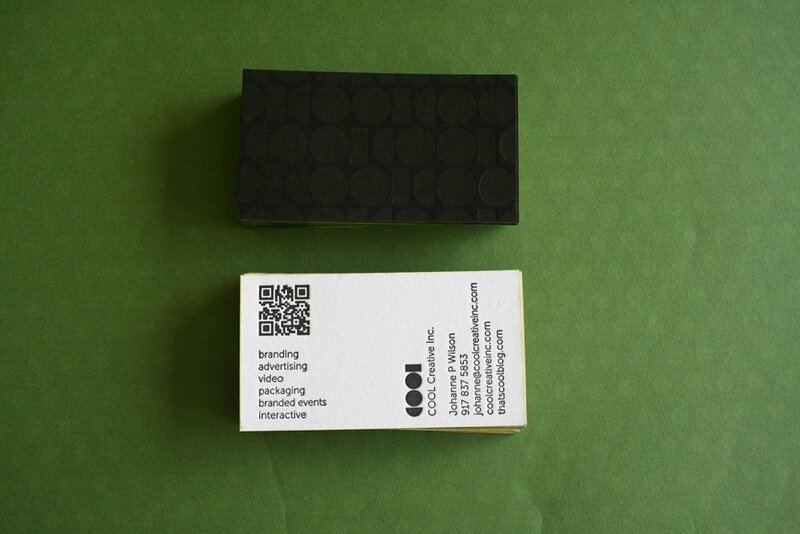 I just love a super-unique business card!! 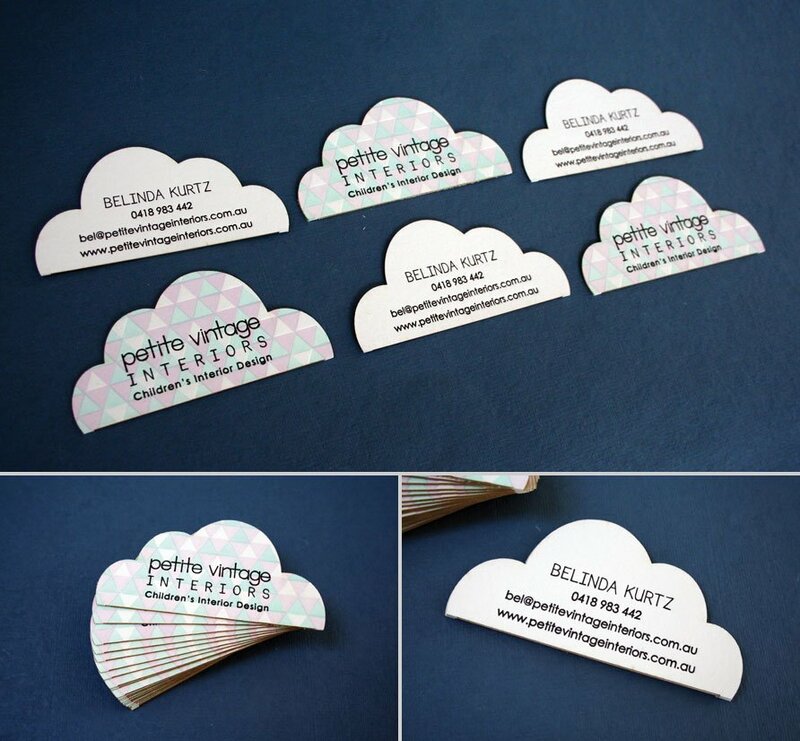 If you happen to live (or be visiting) Queensland, Australia’s beautiful Gold Coast, go check out Petite Vintage! If you live in Australia, they are happy to do consultations for folks on the Gold Coast, Sunshine Coast and in Brisbane. You can find more information about them, and view a gallery of rooms they’ve designed, on their website and Facebook page. Thanks so much again for working with us Bel! I’m so glad you love your cards!! All the best! Cool Business Cards for COOL Creative, Inc.
A little while ago we were hired to print a set of really cool (no pun intended) business cards for COOL Creative, Inc. in Miami, Florida. COOL Creative is an award-winning, multi-disciplinary creative studio with world-class experience in the tourism, entertainment, retail, B2B, non-profit organizations, and hospitality markets. They specialize in developing thoughtful creative that leverages a diverse mix of media platforms so that messages will resonate better with consumers. Check out their website or blog! 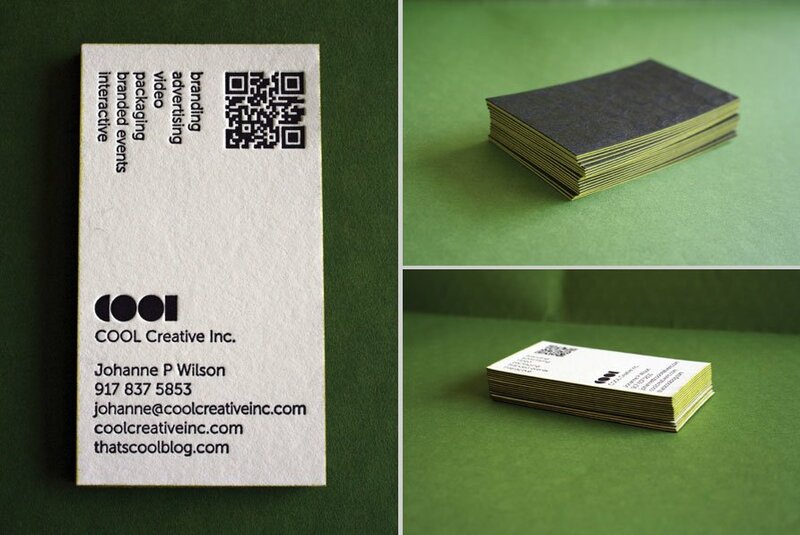 COOL Creative’s super-cool business cards were letterpress printed on a custom duplexed black and white stock. The white side featured their contact information and logo, along with a functional QR code in black ink. The reverse, black side featured a repeating pattern of their logo printed in a varnish. The black and white duplex paper is fancy in and of itself, but in order to make these cards even fancier, we also edge-painted them with a bright, neon green edge paint. Super-COOL! Thanks so much, Johanne and Terrance, for working with us on this project!! Hey Everyone! Long time, no see! I hope all of you fabulous stationery-lovers out there have been having a great summer! Ours has been super-busy, but awesome, all the same. 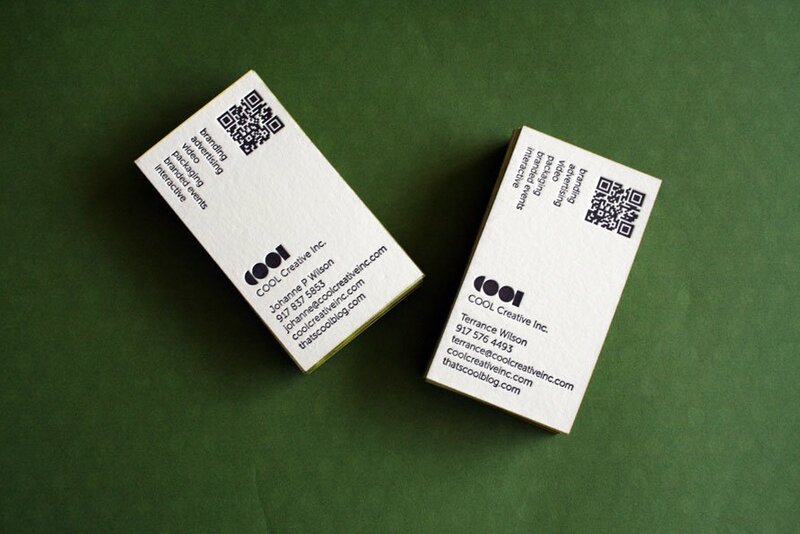 Earlier this year we letterpress printed a really sweet set of square business cards for South Carolina graphic designer, Bonnie Bakhtiari, of B is for Bonnie Design. 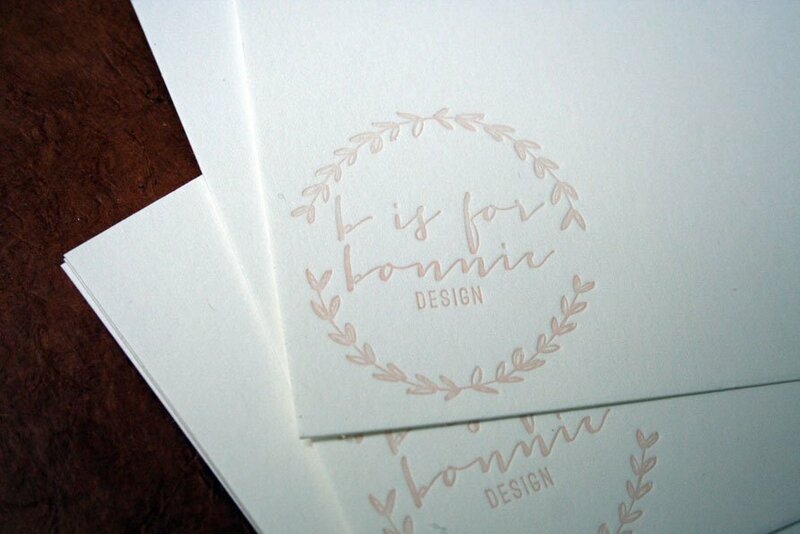 Bonnie’s business specializes in small business branding and wedding paper goods. She was a journalist by trade, but broke into graphic design while planning her own wedding in 2012. Bonnie’s business cards are 2.5″ square and were printed double-sided on super-thick 100% cotton duplex paper in a light, dusty pink ink. The front side of her card features her logo while the backside has all of her contact information. These cards are simple and informative, but the light pink ink, feminine logo and typography, and letterpress printing add just the right amount of whimsy to the design! 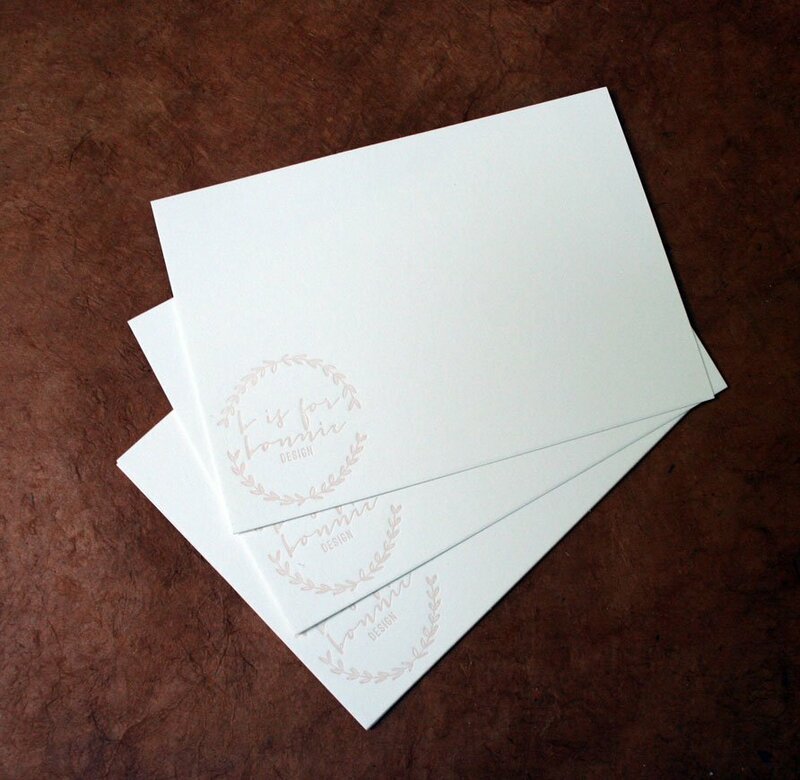 Bonnie loved her cards so much that she also hired us to print a set of coordinating business stationery to match them. I just finished those yesterday and shipped them off to South Carolina, but you can see a couple of images of them below. 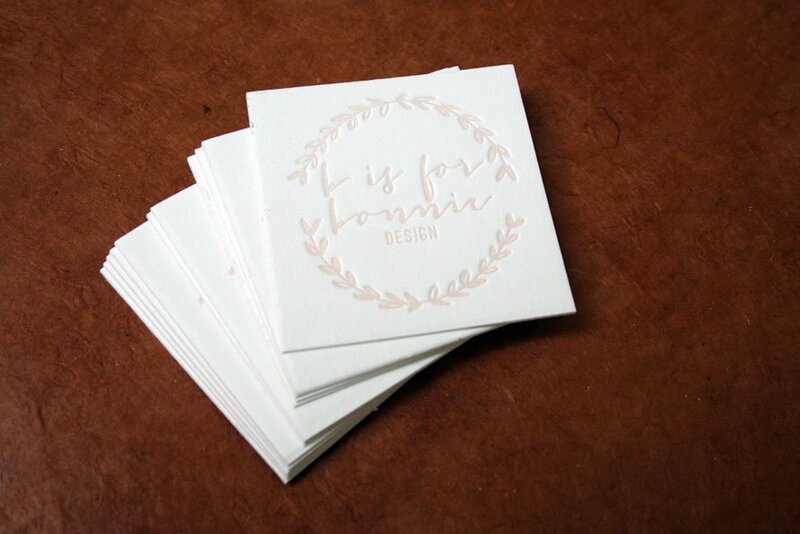 These stationery cards measure 5″x7″ and feature Bonnie’s dusty pink logo in the bottom left corner. 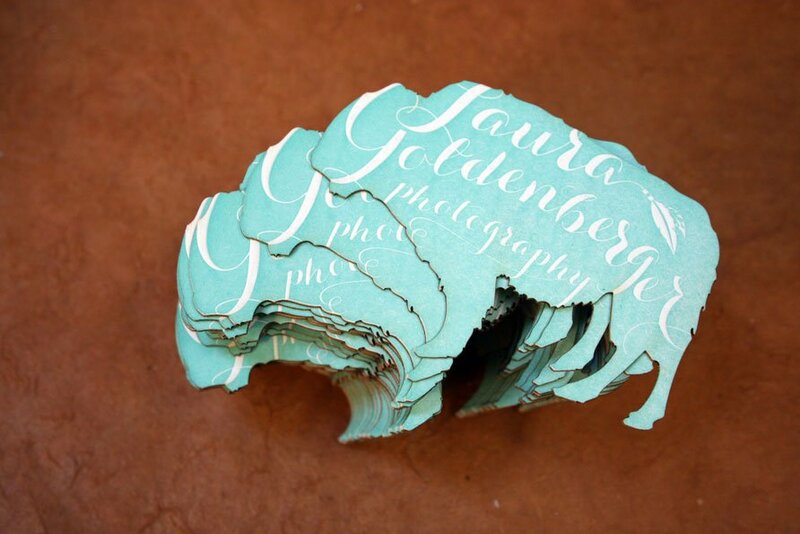 They’ll be perfect for sending notes and other correspondence to her clients! I love working with Bonnie and can’t wait to collaborate on some letterpress printing work with her for some of her wedding clients. Check out Bonnie’s site through the link above. 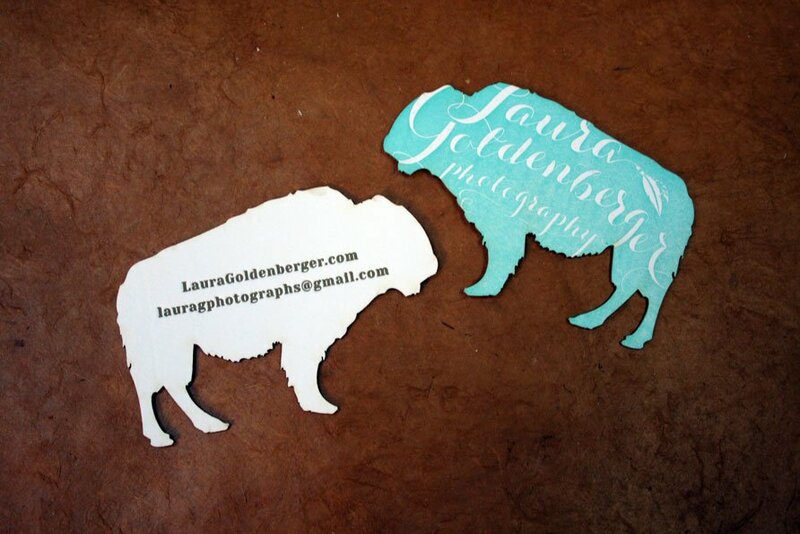 If you like her aesthetic, definitely contact her about designing your wedding or business stationery! We’d be more than happy to print anything she designs! 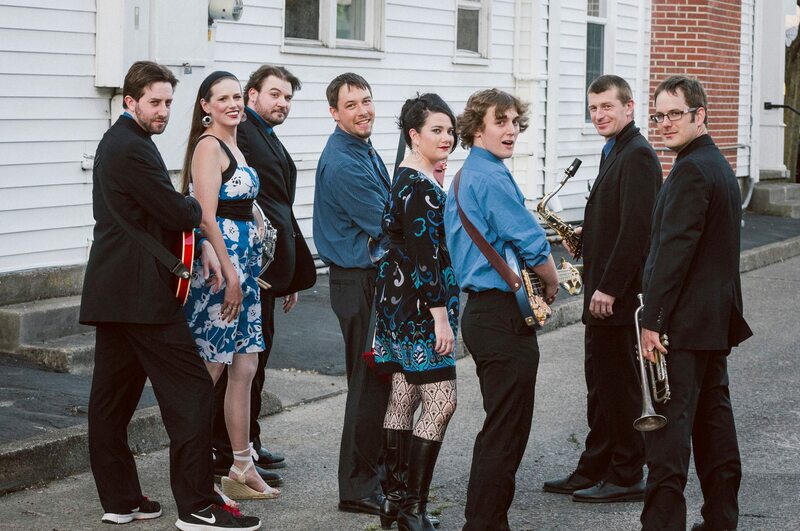 She also wrote a really nice blog post about us back in March on her blog. Check that out too! Thanks so much again Bonnie! If you ever need anything else, just let us know!